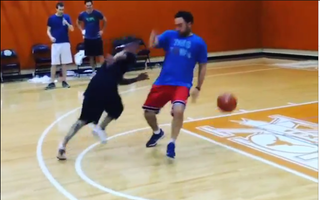 Justin Bieber is back on the court, ballin' like only Justin Bieber can. Which is to say, he's forcing his poor manager, Scooter, to pretend like he just got juked out of his shoes by Justin Bieber's KraZy Dribbling Skillz. Seriously, look at this dive. You'd think he was some jobber selling for the Undertaker. This video is fraudulent and embarrassing.